The Odyssey Toro is another entrant into the needle bearing market. Made in Taiwan, the Toro has a locking (cinches around steerer tube) headlock nut as a separate piece not integrated in a single piece. The separate locking nut is made of aluminum in a thin teardrop shape with the narrowness at the riders side. The lock piece has well cut threads for the steerer and a groove that a sturdy Black plastic stem seal snaps into. The narrow side of the lock piece has a hole drilled horizontally through it with threads tapped into the end of it at the right side. This narrow area is then cut through making a cinch mechanism when a steel bolt with a 2mm hex head is tightened. Beneath the lock piece is the upper cup, but because this a needle bearing headset this upper piece becomes the seat for a black steel cone race that is bonded, (and therefore non-replaceable) to the aluminum surface. The top of this cone piece shows good machine work with well cut sides for the headset wrench to grip, and a recess for the Black steel head key washer that is stamped from 2mm thick plate to lie into. The lower race of the upper assembly is made of aluminum, the steel race is again bonded to alloy piece, and there is a groove that holds an O-ring seal around the perimeter. Like other needle bearing headsets the lower assembly has the cup and cone race traditionally positioned. The cup is forged of aluminum alloy and machined to de-burr to make perfect the surfaces so it can be pressed evenly into the bottom of the headtube. The steel bearing race is bonded (glued, cemented) within the alloy cup. The fork cone race, forged of aluminum, has a well polished steel cone race bonded to its upper surface. At the junction of the race and the alloy seat, a recess is formed, that seats a flush mounted O- ring to prevent lower contamination. The Toro uses twenty-two 2.5mm diameter needle bearing that are 4mm long in a Black plastic retainer in each of its bearing assemblies. The tightening wrench isn't included. 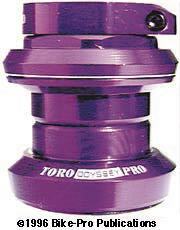 The Toro comes in 1" or 1 1/8" diameters, in four colors, Blue, Black, Lavender, or Silver. 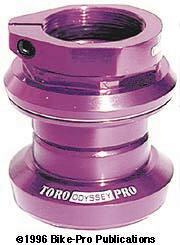 The Toro stack height is 33.5mm, the 1" size weighs 100 grams, while the 1 1/8" size weighs 114.5 grams.